FREE-RANGE BABY LOSING FREEDOMS; BURP!! This is Bob Moore, husband to me and the father of my children. 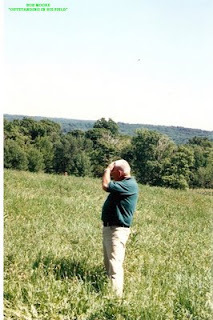 I've always referred to this photo as "BOB MOORE, OUTSTANDING IN HIS FIELD." That's tongue-in-cheek, perhaps, but he always was outstanding in the field of fatherhood as well as the field of home-building, with which he supported us. He is but one outstanding father in the world. How about yours? If your father is living, call him, visit him and/or hug him. If he has passed away, think about him. My own father died when I was 14, and I never stop thinking about him. He had tremendous influence on my life and what I chose to do as a career; I became a newswoman. My father-in-law was an excellent role model to his children, as to how to raise and love and set them on the right path. He also is deceased, and he also is missed. In your comments (send to randrmoore@gmail.com), please pay tribute to your own father or a favorite father figure in your life.